Until now we have only considered ideal gases and we would like to show that the properties , , , etc. are true state variables and that the 1st and 2nd laws of thermodynamics hold when the working medium is not an ideal gas (i.e. a two-phase medium). An elegant way to do this is to consider a Carnot cycle for a two-phase medium. To state the fact that all Carnot engines operated between two given temperatures have the same efficiency is one way of stating the 2nd law of thermodynamics. The working fluid need not be an ideal gas and may be a two-phase medium changing phases. The idea is to run a Carnot engine between temperatures and for a two-phase medium and to let it undergo a change in phase. We can then derive an important relation known as the Clausius-Clapeyron equation, which gives the slope of the vapor pressure curve. We could then measure the vapor pressure curve for various substances and compare the measured slope to the Clausius-Clapeyron equation. This can then be viewed as an experimental proof of the general validity of the 1st and 2nd laws of thermodynamics! 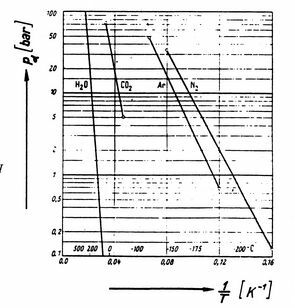 The beauty is that we have found a general relation between experimentally measurable quantities from first principles (1st and 2nd laws of thermodynamics). Note that the vapor pressure curves are straight lines if is plotted versus and that the slope of the curves is , directly related to the heat of vaporization. 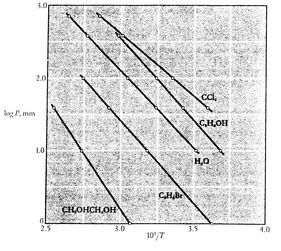 Figures 8.9, 8.9, and 8.22 depict the vapor pressure curves for various substances. The fact that all known substances in the two-phase region fulfill the Clausius-Clapeyron equation provides the general validity of the 1st and 2nd laws of thermodynamics!